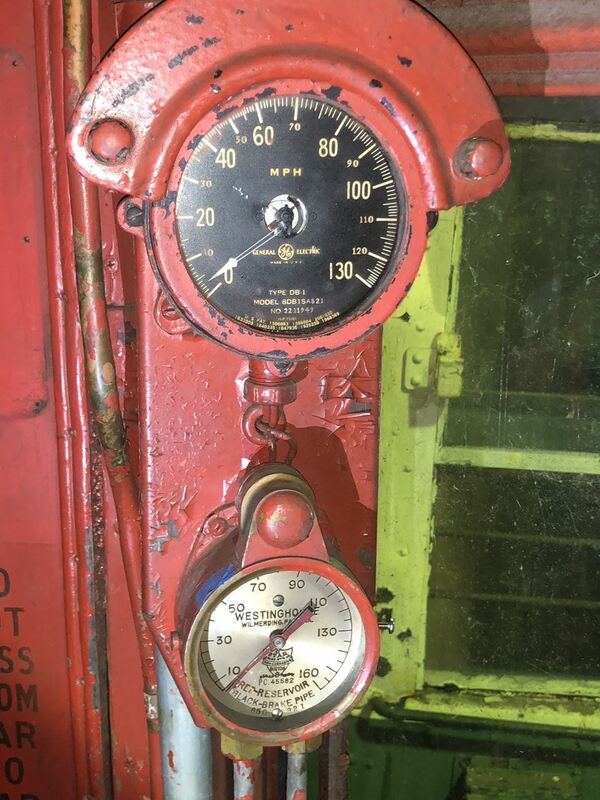 Following it's power wash, 40 got a late night push into the barn for further prep. 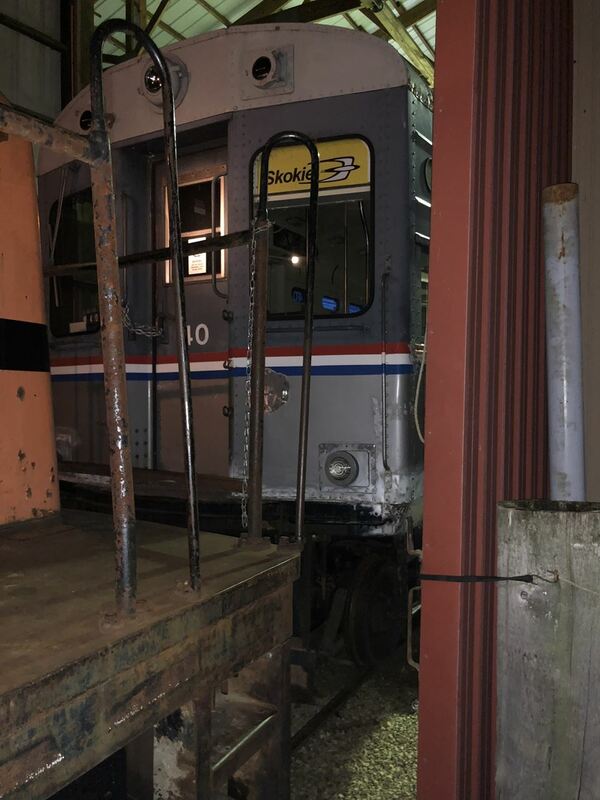 1030 getting moved over a track to allow for the above move. Long day for Fred, Mike, and Jeff, as 1030 was no small task to move. 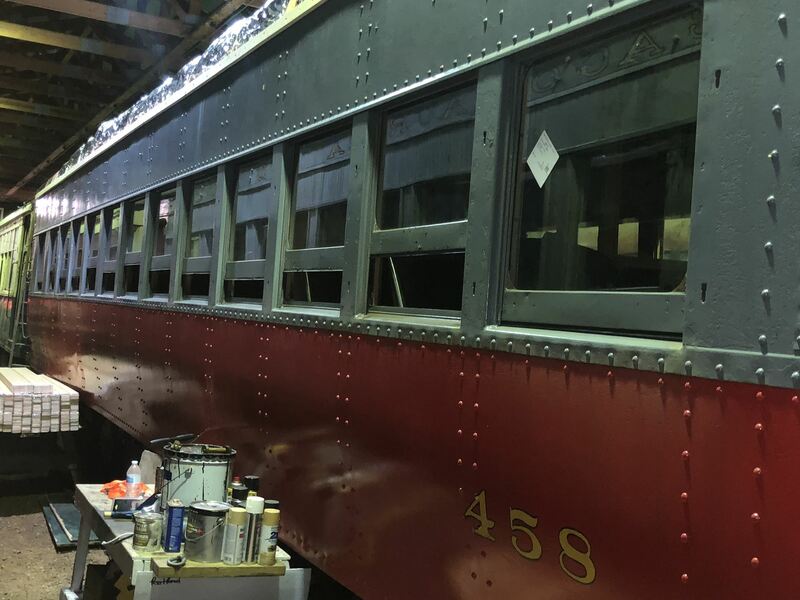 40 Paint job well underway! 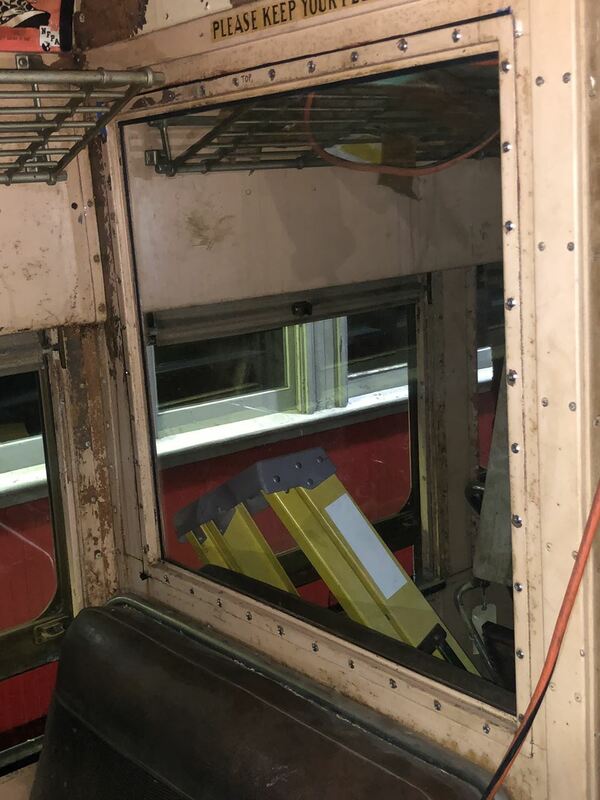 We didn't grab any pictures, but Mike G. and Jeff have spent many LONG nights installing all the roof cleats, so the trolley boards can go on, and this car finally have it's own poles! 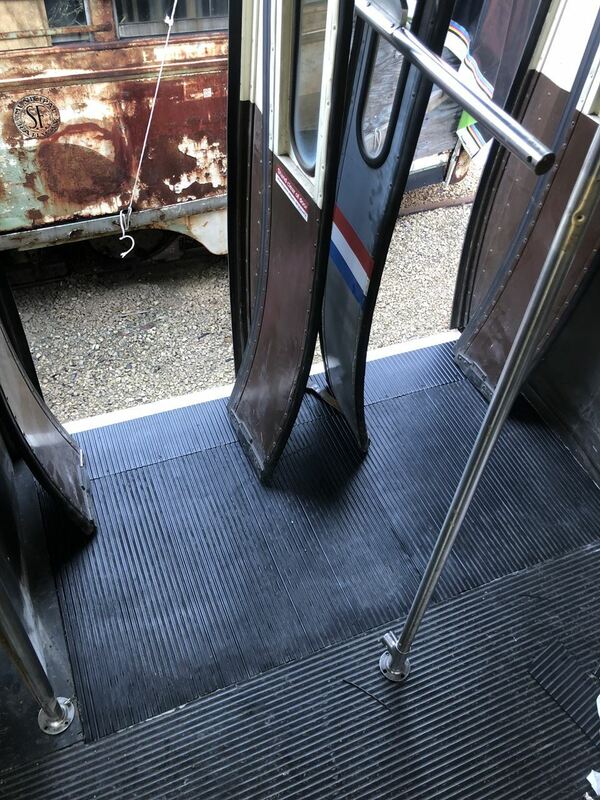 So a while back you may remember we started replacing the floor in one of the vestibules of 40. 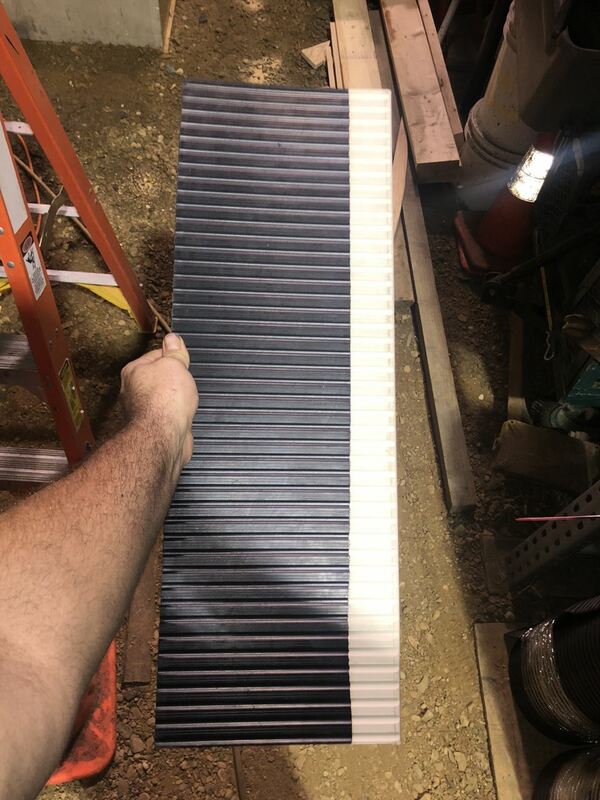 The project started a couple months ago. 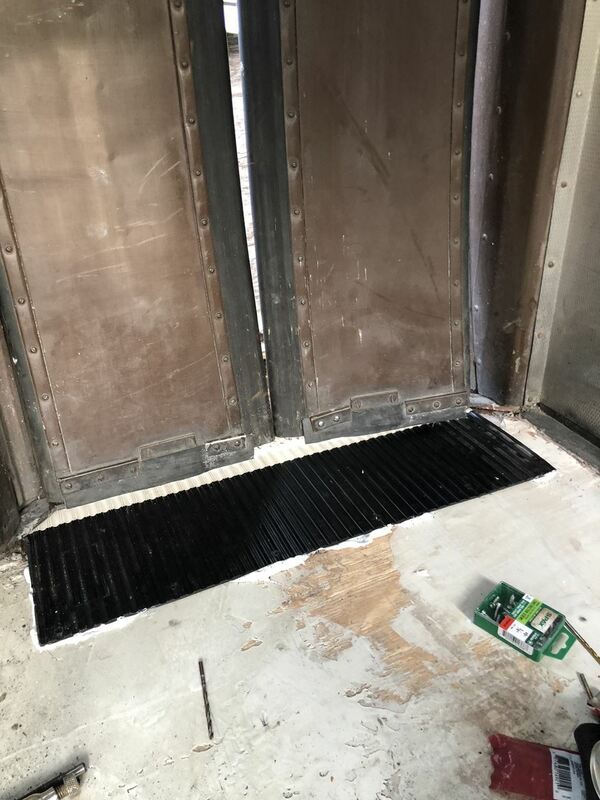 The goal was to get new step treads installed like you see below, as well as all new flooring material in the effected area. So the floors are installed here, and the leveling has been done. 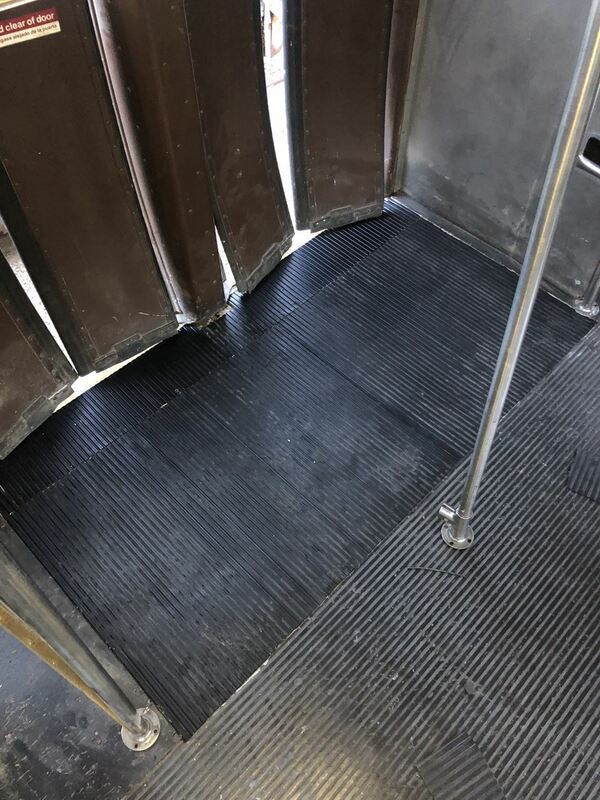 First step tread installed. Success! 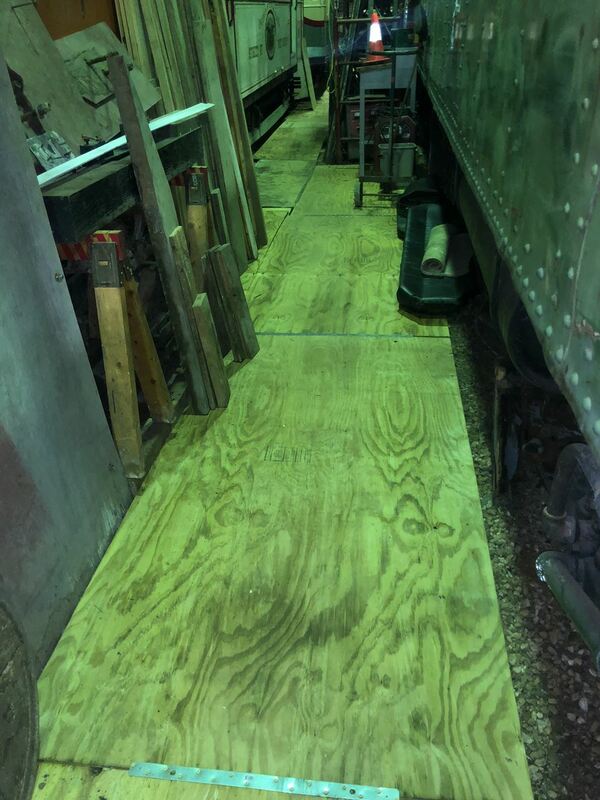 Then the task of installing the very hard to find flooring. 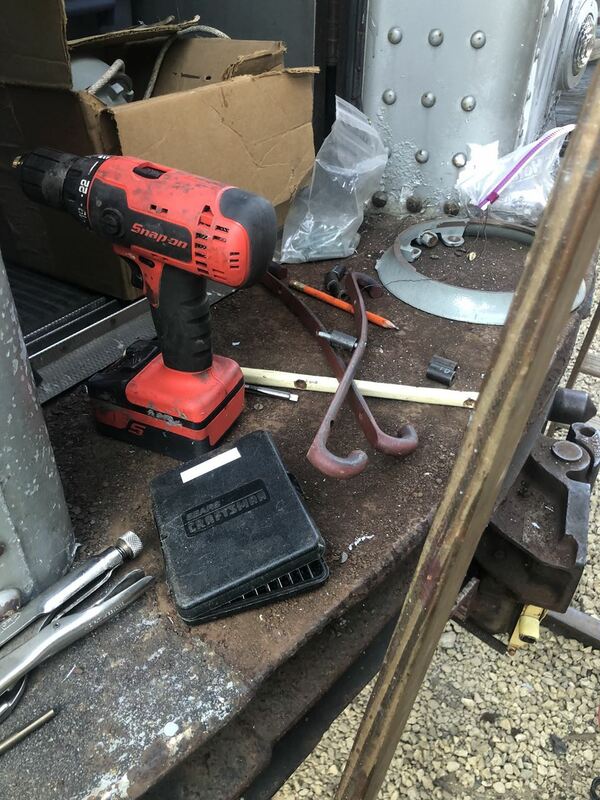 The piece needed to consist of two separate parts, and both parts had to be custom cut to fit correctly. Actually looks pretty darn good! 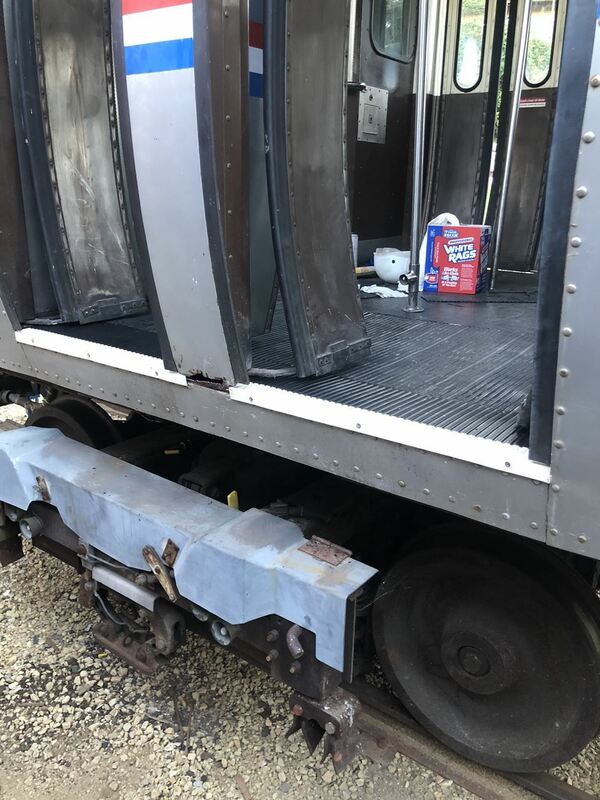 We were able to get the train door diamond plating up to address the massive rust issues below. 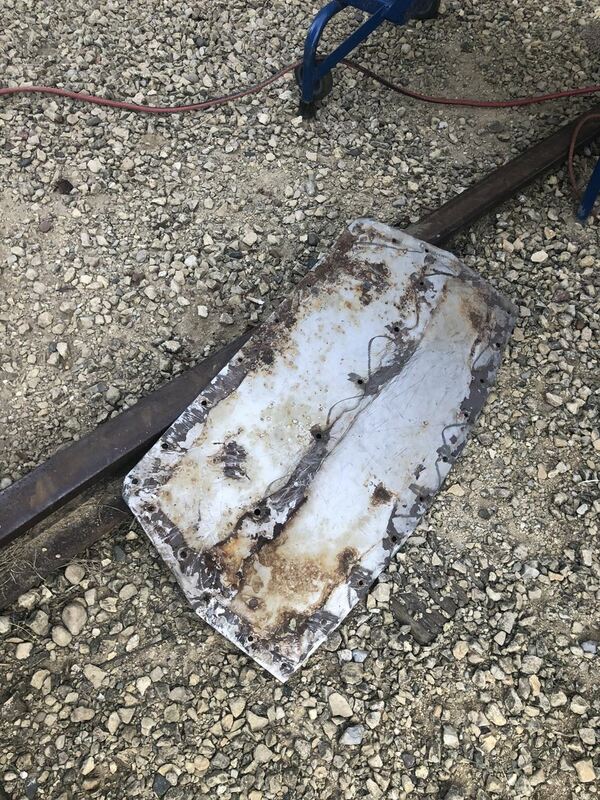 Diamond plate, waiting for a good sanding, which was done before the day ended. 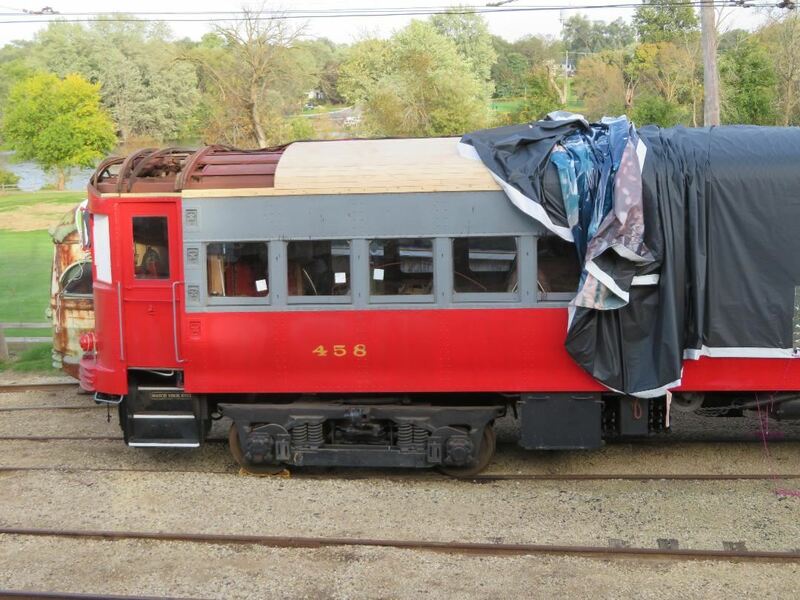 40 did not have trolley poles on it when we got it. 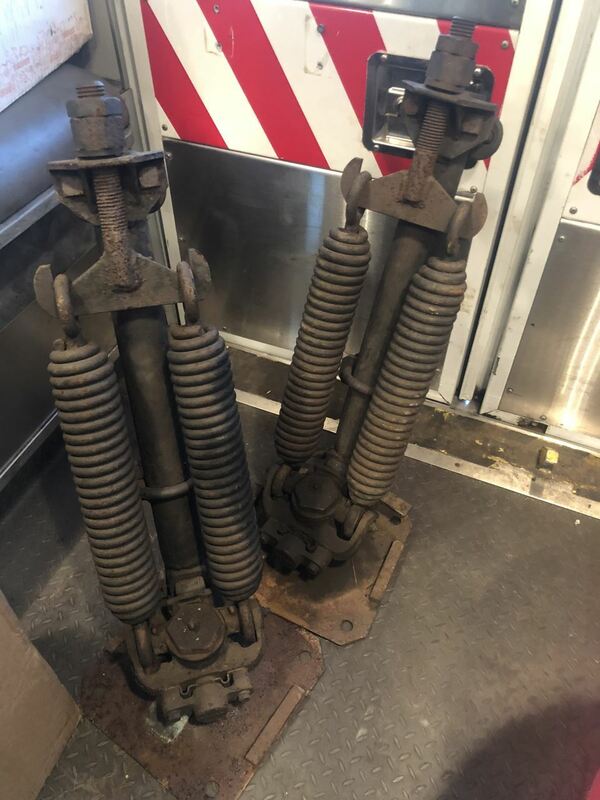 They had been removed prior to our ownership. 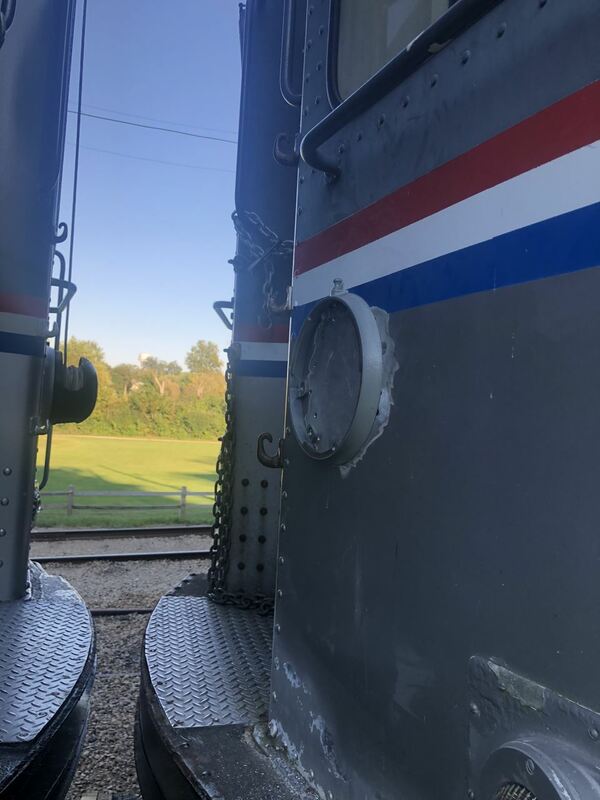 With the coming paint job we spent some time finding the original holes where the retrievers were originally mounted, and successfully mounted the new Earll flanges. 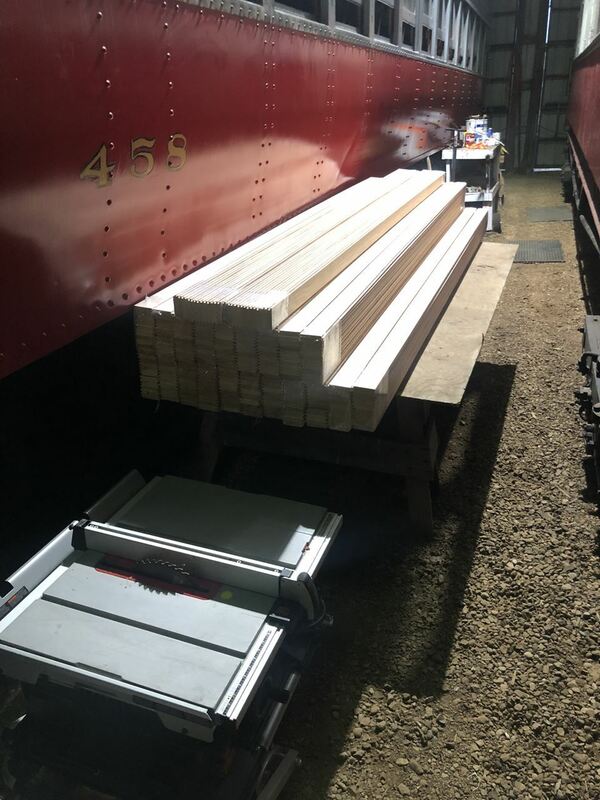 Trolley bases we were able to acquire in a trade deal with another museum will be fully serviced and end up on top of 40. 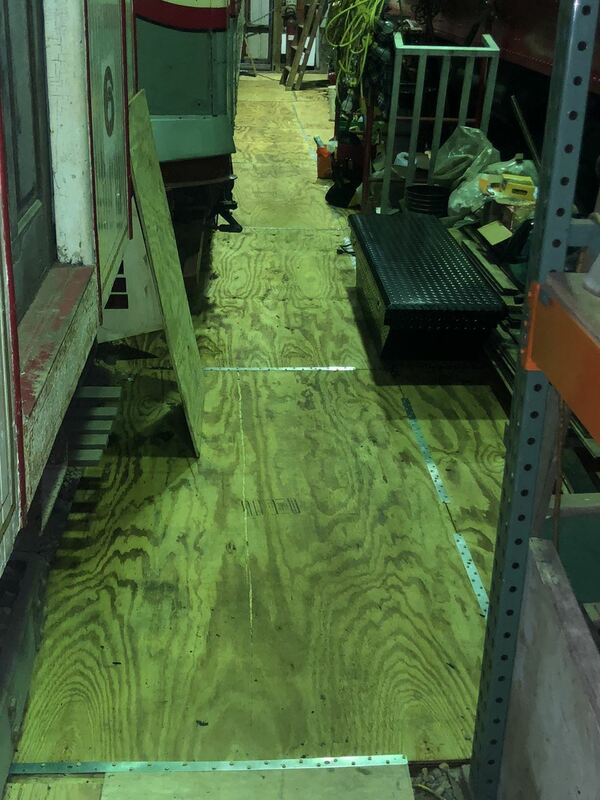 Among many things the Lowe's of St. Charles donated was this special treated plywood, that we have used to upgrade our flooring down the entire west aisle. 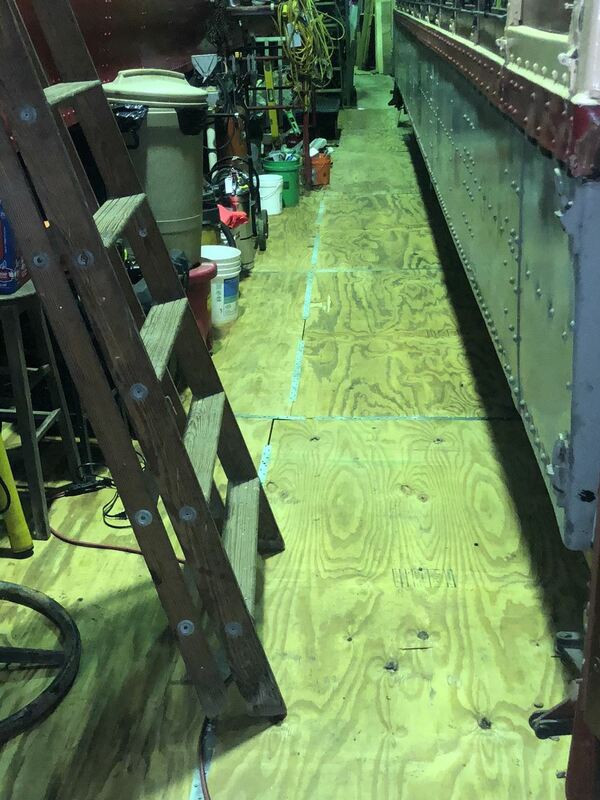 This is huge for the car department to have a clean working area where a lot of precision painting and other work is done. Not to mention it is a heck of a lot easier on the feet, and the eyes. 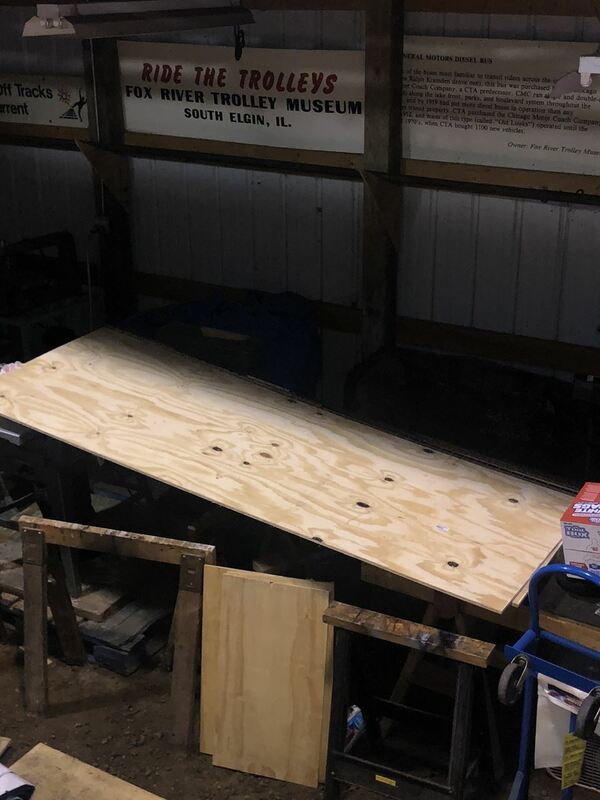 OK, OK, so maybe it looks like just a piece of plywood, but Mary W. has been working diligently to construct a Clock Tower for our 2018 North Pole. Stay tuned, she has big plans! 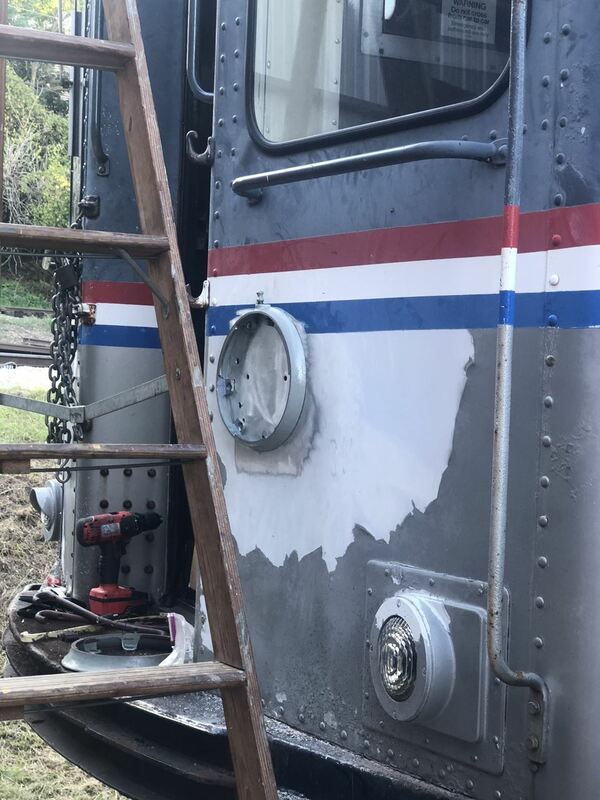 Thanks to a recent addition to the car barn roster, Andy has started to work on removing layers, and layers of paint, filler, and rust, on the exterior of 4451. The goal is to stabilize the end walls, that have rotted away from the floor. One of the windows damaged during the vandalism was this motorman's windshield. 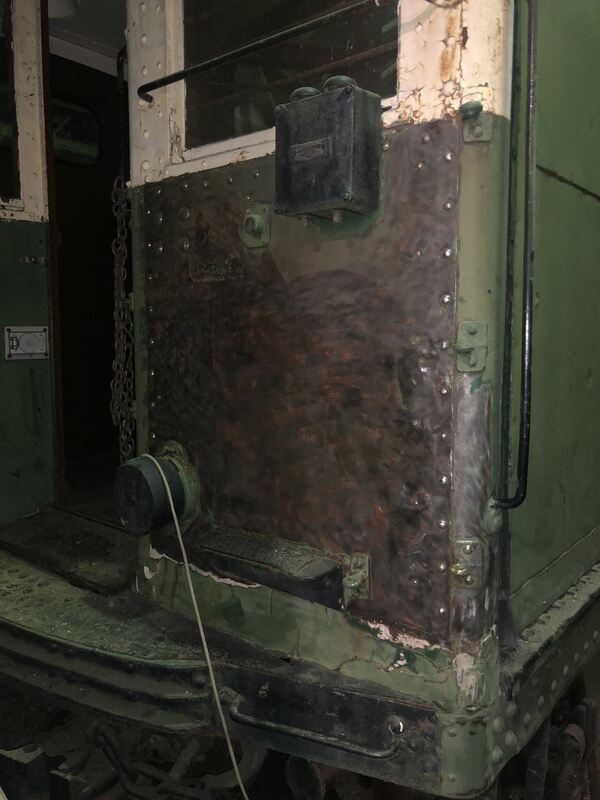 Here you can see it has been removed and the sash is currently waiting for the custom ordered glass. This may be one of the most exciting things we have to report! 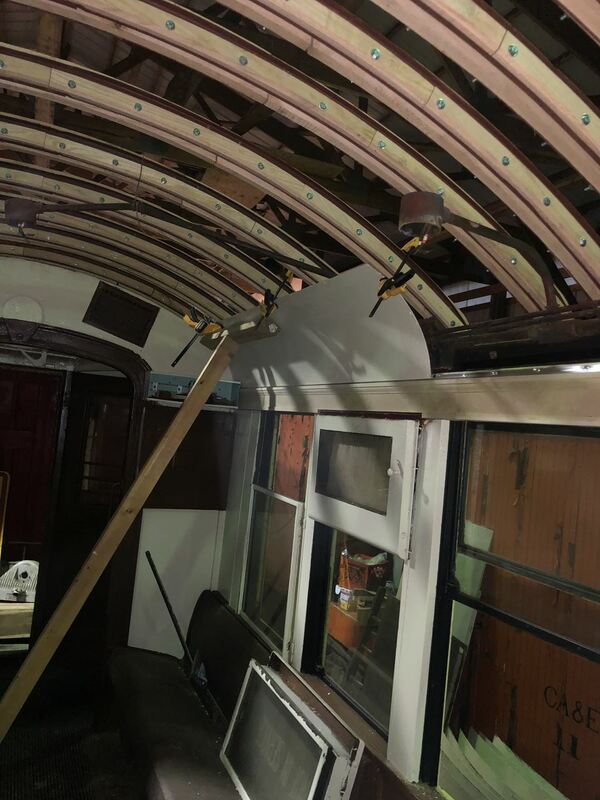 LOOK, you can see the first ceiling panel being reinstalled ! 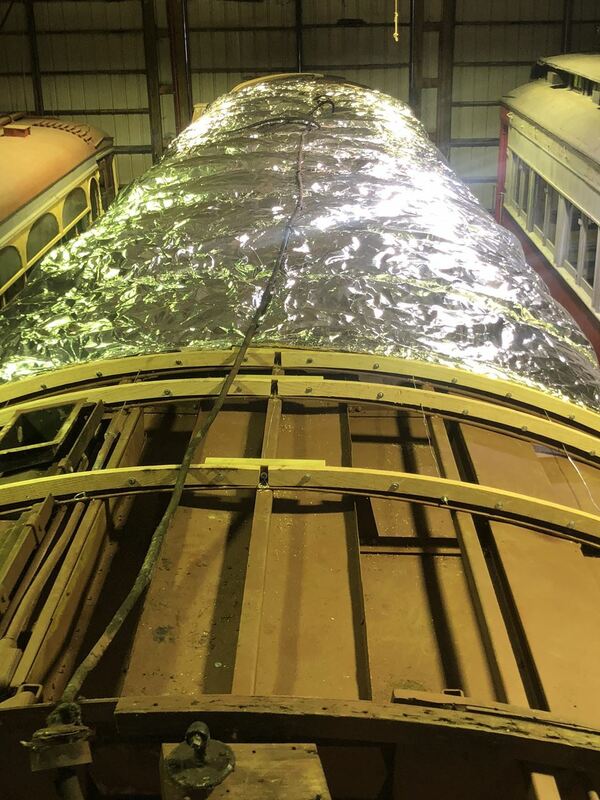 Being that this car started the season with a completely rotted roof, and ceiling fallen in, to here, with it's roof structure completely restored to the point that panels can be reinstalled, we are doing the happy dance! 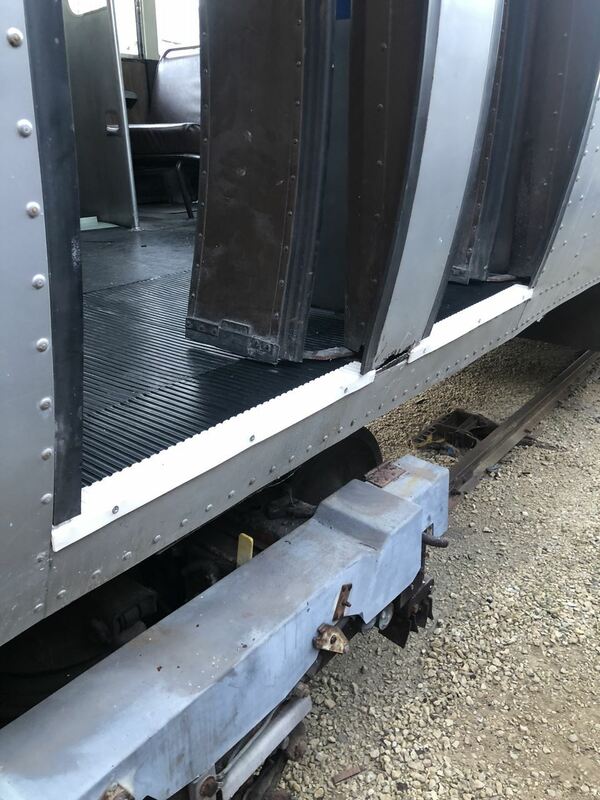 The Car Department has not at all let the vandalism stifle our progress on 4451. If anything, just the opposite! 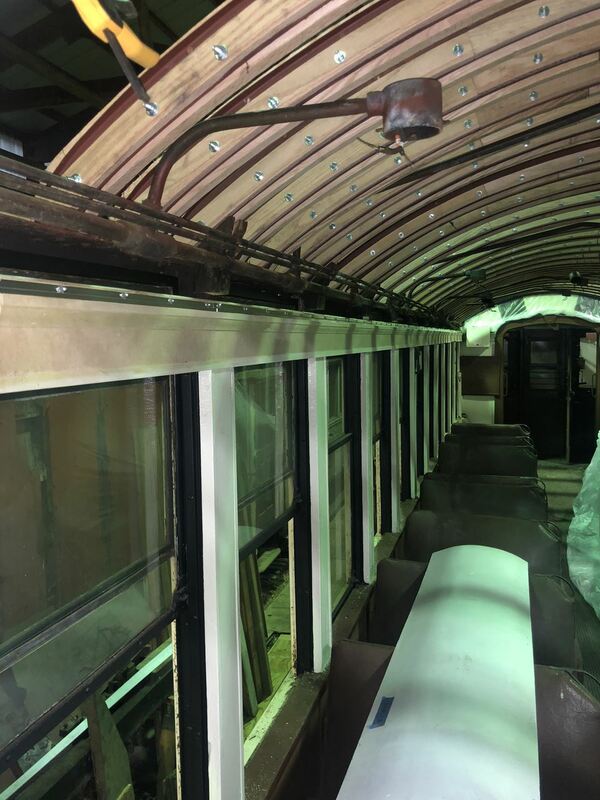 Hear on the left, going down the side of the car above the windows, the newly custom made trim is installed. 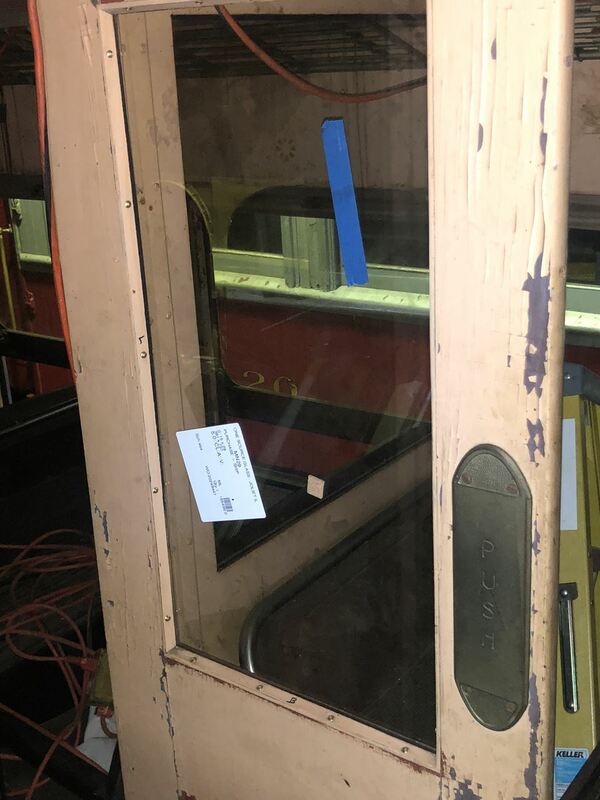 This trim was all severely rotted out from water intrusion, and this very detailed trim pattern was not a small order to recreate. 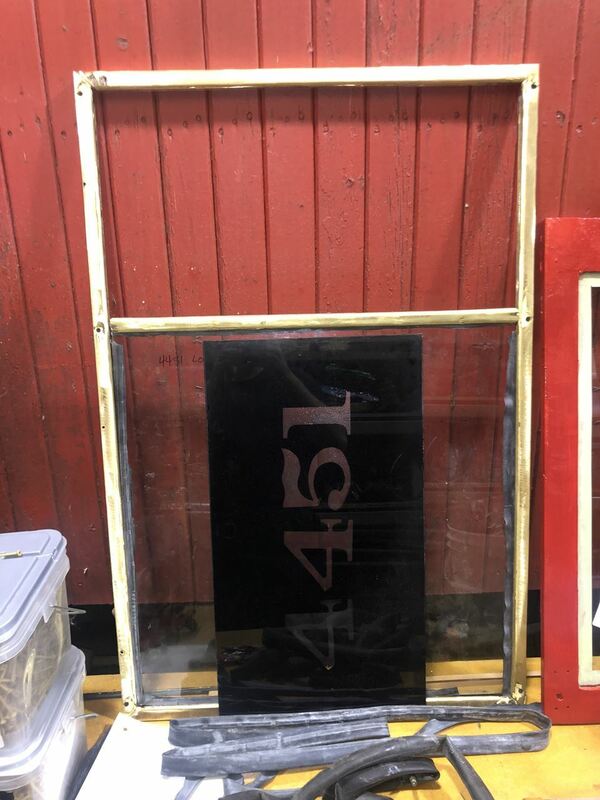 Huge thank you to Fred L. for supplying 4451 with two marker windows! 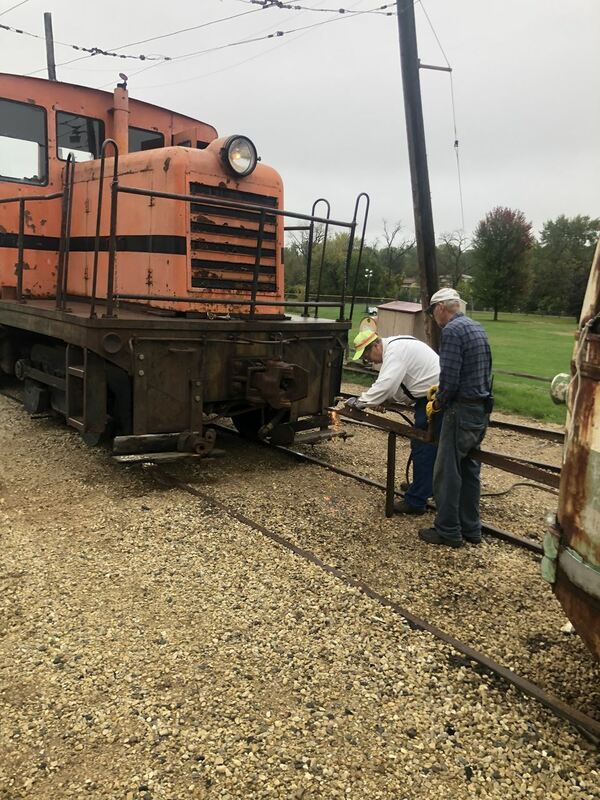 Here you can see one being installed. 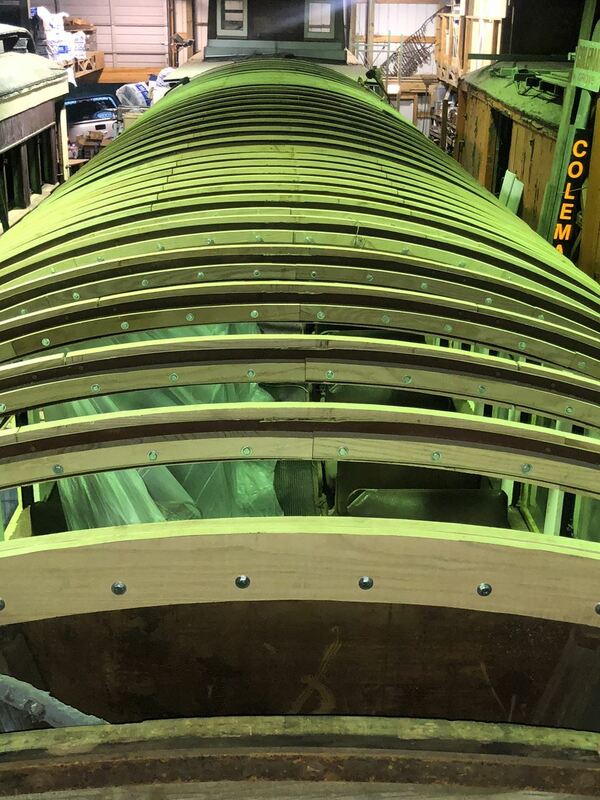 A quick shot of the roof above with all the completed center roof ribs..... so clean and straight ! 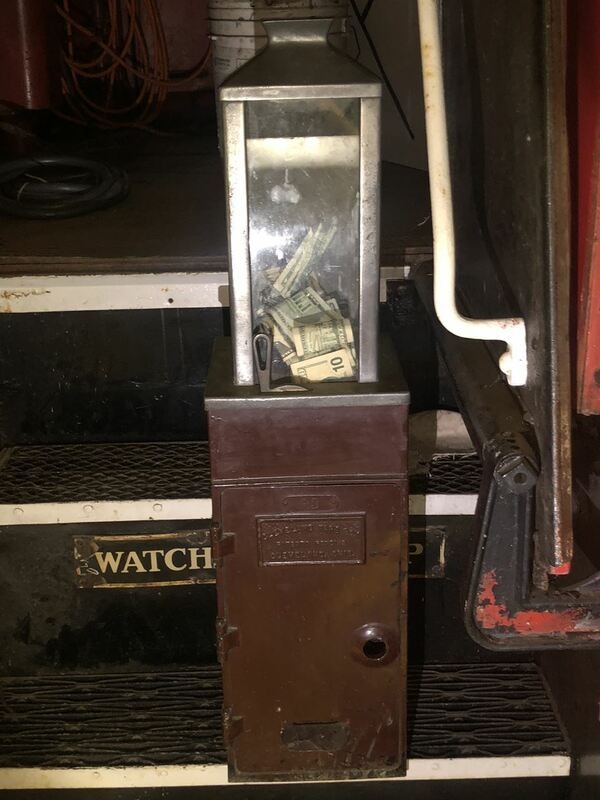 Well wishing visitors are still filling the fare box! 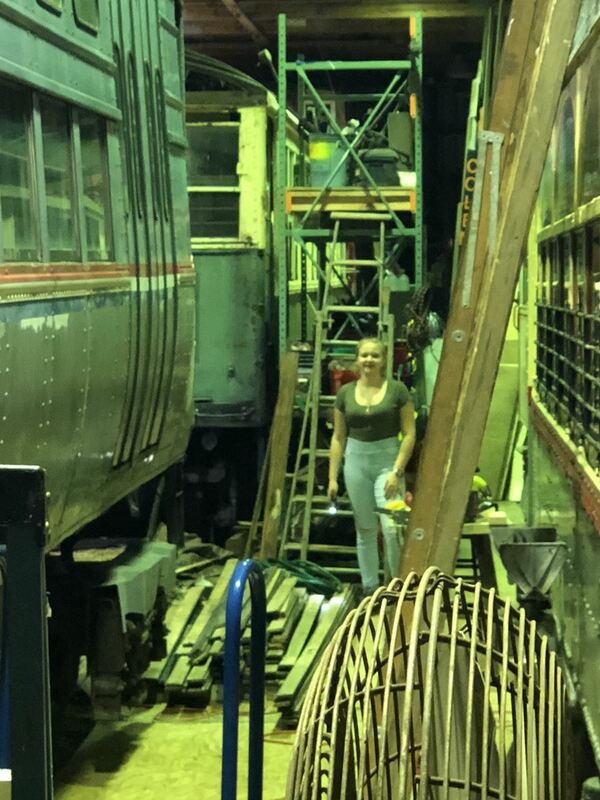 Thank you to everyone who has continued to donate and keep our vandalism repairs going! The Great 458 PUSH ! 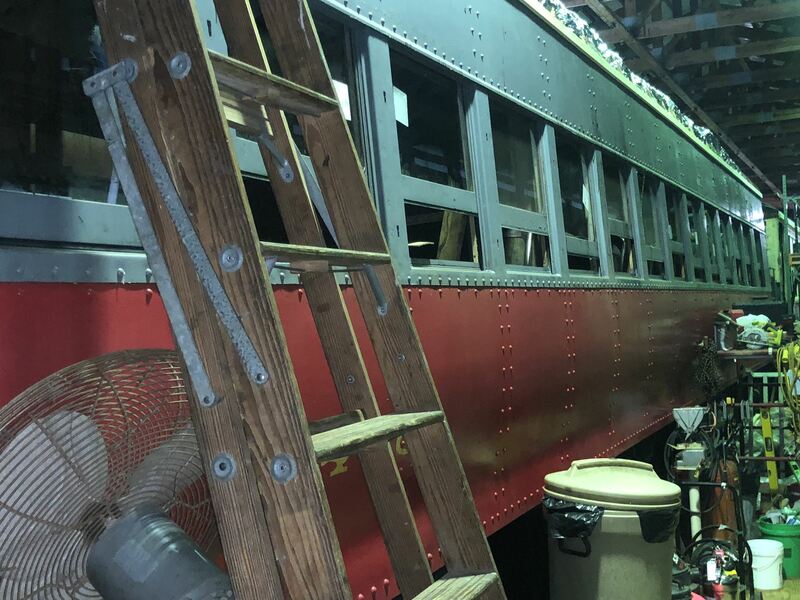 All hands on deck to get 458 buttoned up to go outside for a bit, and give up it's inside spot so 40 can get it's scheduled paint job. Here you can see the custom ordered tongue and grove for 458's roof. Hope the next time we show a picture of this wood it will be on the top of the car! 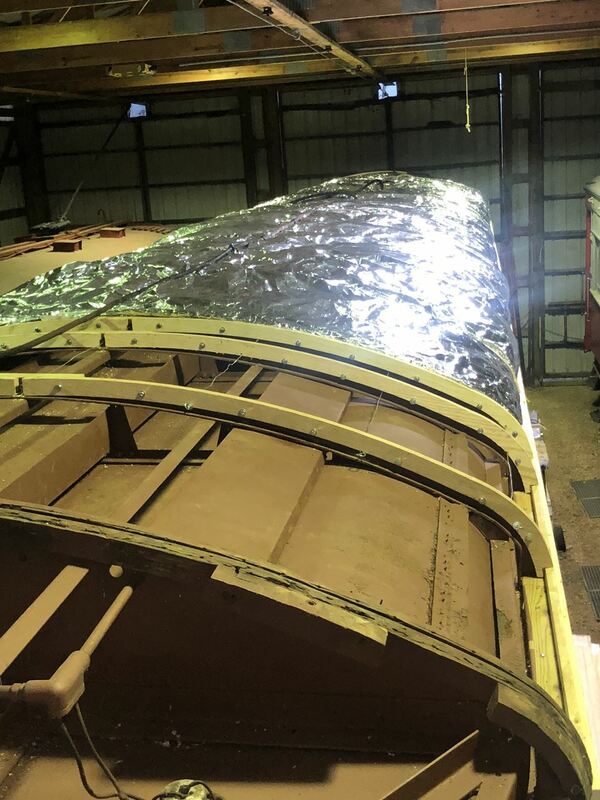 The center section of the roof has all the roof ribs done, all the insulation stabilizing wire installed, insulation and vapor barrier installed. This roof has been a huge project, and we really want to have the center section done within the next week or so. All these below pictures are reflecting the hundreds of hours Mike G. and Fred L. have devoted to the glass repairs on this car. 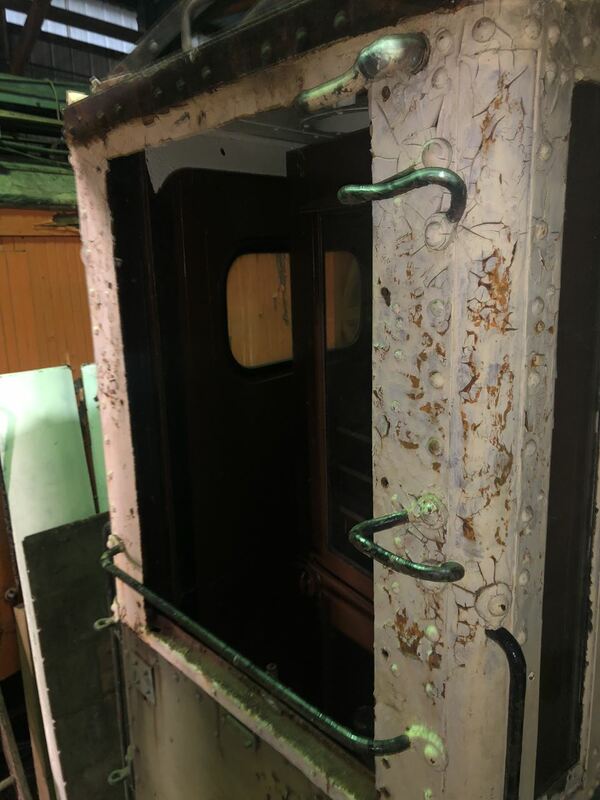 ALL side windows have been replaced. 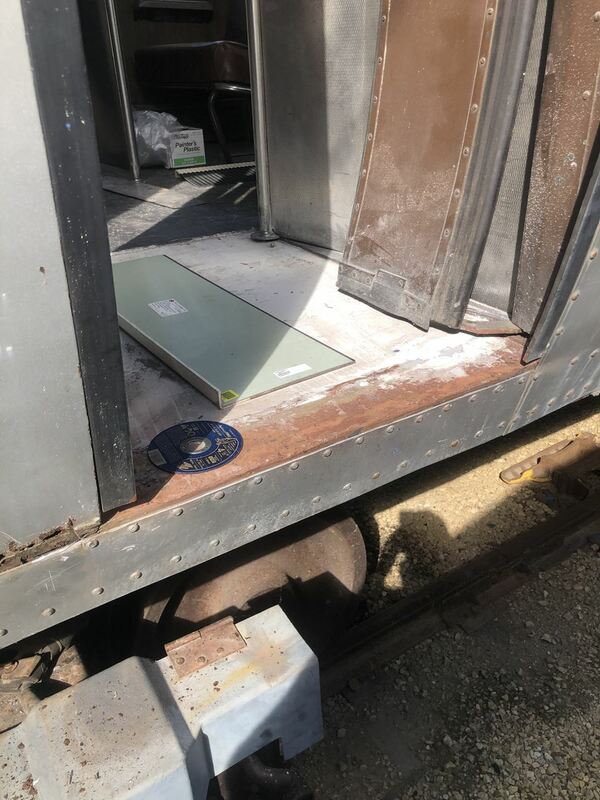 Most of the interior glass has been replaced, and they have even sourced and installed new glass for the gauges that were damaged. 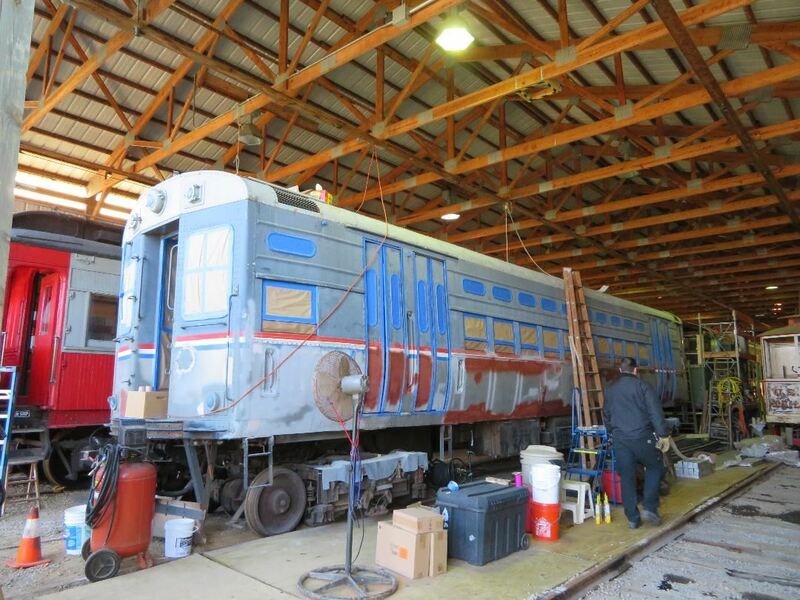 The Trolley Museum recently hosted a fund-raising event by the Michael J. Fox Foundation for Parkinson’s Research. Visit our You Tube Channel for videos and subscribe! Michael J. Fox is the star of the 1985 movie “Back to the Future”, and its sequels, in which a specially outfitted DeLorean automobile is able to travel backwards and forwards in time upon reaching a critical speed of 88 miles per hour and using a fusion power generator. He also suffers from Parkinson’s Disease. 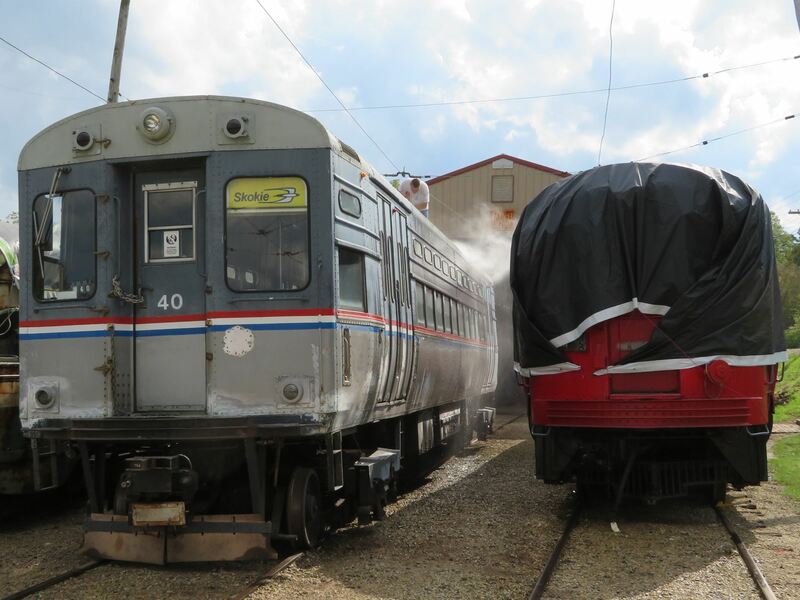 Volunteers from the Foundation brought their DeLorean, appropriately modified to resemble the movie car, to a convention of DeLorean owners and collectors being held in Saint Charles, IL. 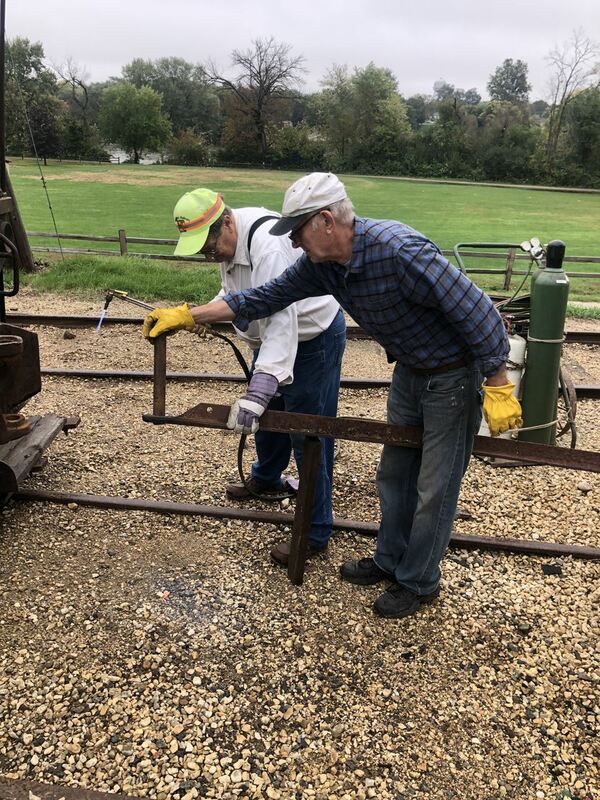 Through a contact with one of the Museum members, they inquired about operating their car on our tracks, raising funds through offering rides simulating the rail running depicted in later movies. We were able to accomodate them. 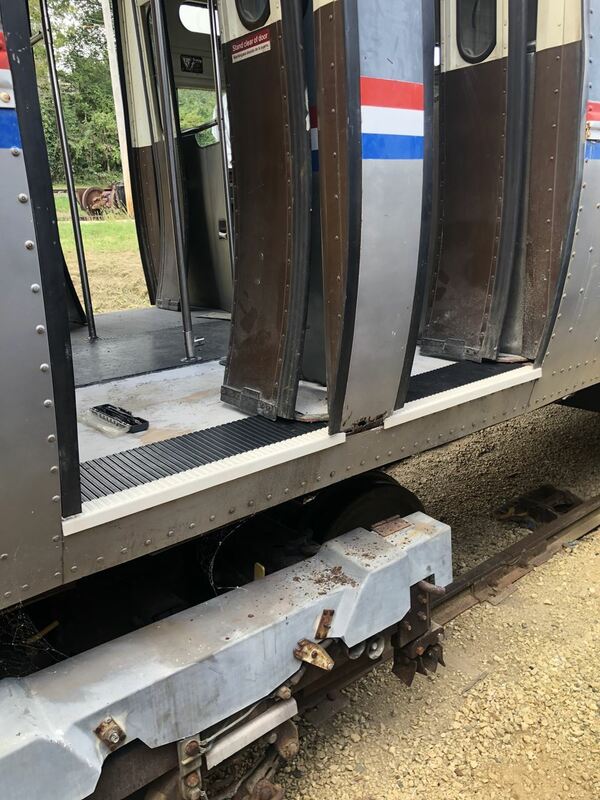 The car was highway driven to the Museum, where the regular tires were removed, and railroad flanged wheels were attached. 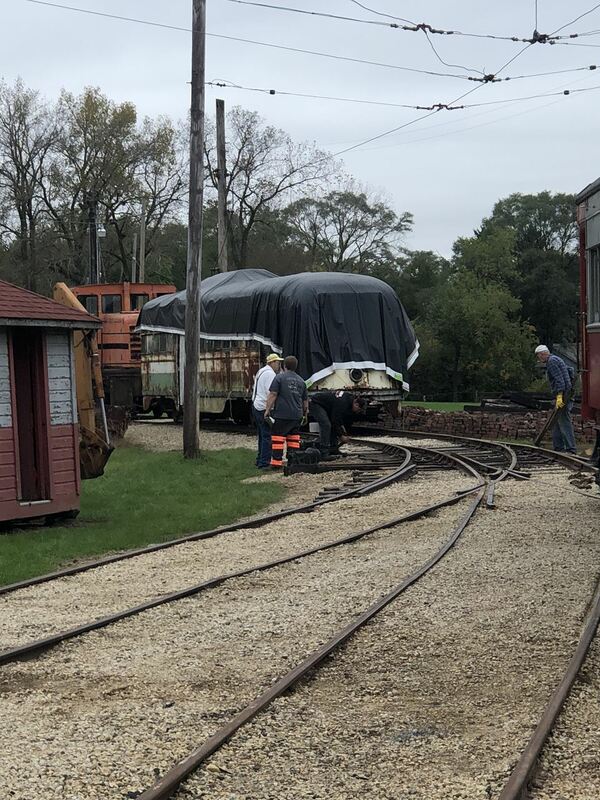 They made multiple trips up and down the line. Riders in the car could donate (or not) as they wished. Fox River personnel were on hand to ensure a safe and enjoyable event for all involved. The car never reached 88 miles per hour, and thus always remained in the present time.